There are currently 78,124 users on this website. I went to the local coin show, and bought a few notes. I already had the $1, but completed my set of Hawaiian Notes. Very satisfying to complete a set of notes. Grats fuzzy! Thanks. They had been on my "want list" for a while. I have a Hawaii set myself I got awhile back in XF condition or so. I could however only dream of collecting Hawaii star notes as they are 7 or 8 times more expensive. Which makes me curious, what is on everyone's want list(in terms of paper money US) anyway? Additional notes I will watch for: State of Georgia notes and Gold Certificates. I saw some of each at the coin show where I got the Hawaii notes. And those were found after finishing my Morgan dollar set. I don't know if you use Heritage or not, But if not, You might wanna check them out. They got a major auction going on in April and Heritage always has a very nice selection of notes ( all kinds). They usually give you a decent price (similar or less to that of eBay auctions) even with the premium and shipping costs. I haven't used Heritage before, but I will take a look. Thanks. I have a quick question that I'm confused about. 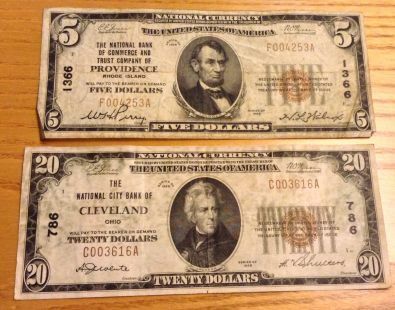 I have some star notes that I am looking up on mycurrencycollection.com and I read on the site that the star notes with the smaller run sizes are considered to be more rare and valuable. I believe it said run sizes of 640,000 or less were considered rare. My question is: can you simply tell the run size by the serial number or can it be random. 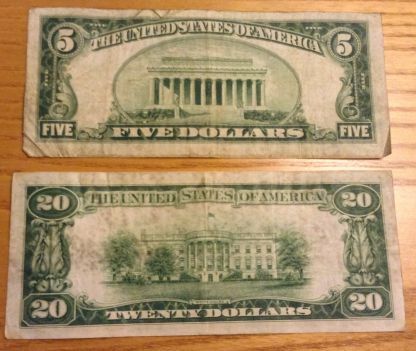 For example, does a star notes serial number have to be under 00640000* to have a run size of under 640,000, or can it still be a low run size even if the serial number were to be something such as 12345678*. Thankyou. I hope my question is clear enough to understand. I believe it is the former rather than the latter. I am however far from being an expert. Not an easy star note to acquire but finally part of my collection. Basically you can have a short RUN of star notes with many higher serials. I will try to explain. If the short RUN was the first RUN for that Districts star notes, than the serials will be low. But now let's look at what happens when the short RUN is the third RUN for that Districts star notes. RUN 1 would be normal 3,200,000 notes, so serials = 00000001 through 03200000. Followed by a full second RUN, so serials = 03200001 through 06400000. Now the third RUN is a short RUN of 640000, so serials = 06400001 through 07040000 instead of ending with 09600000. Also, you can have double RUNs as well (06400000) and they can happen anywhere just like short RUNs. Hopefully I explained it OK.
ps. This applies to the more recent series that printed full star RUNs of 03200000 notes. Woodford, now that is a real nice 34 star note you have there. I know how you feel because I remember how I felt when I got mine. Super pickup, enjoy it! Oh and thanks for sharing. I purchased these from a co-worker of mine for $200 (I made the offer and she accepted). Her father's estate was cleared out and she brought in some coins and these two bills. She told me she knew I liked old currency and wanted to see the bills find a good home. I wasn't really interested in the coins she bought in (a bunch of junk silver, bent Indian Head cents, a hole-punched silver 3Â¢, and a very worn 2Â¢ piece) but I didn't have any Nationals in my paper collection until today. It took 11.12 seconds to rattle this change.